I was all prepared to spend this school year advocating for a strong school wellness policy that addressed not using food as a reward, healthier celebrations, and healthier fundraising. Then I found out the Superintendent of Seattle Public Schools had already signed off on a new procedure this summer. I’ve posted it here under procedure and am delighted to now be working on the implementation phase instead. Given the rise of diet and weight related non-communicable diseases and their consequent costs both to individuals and society as a whole, I’ve no doubt that in time we will see formative change. But if we can enact change on the ground, from home to home, school to school, and local community to local community, maybe we can hasten it along by cultivating the attitudes required for both the food industry and governments to take nutrition and health-related public policy far more seriously. My name is Casey Hinds and I am a parent of a new fifth grader. I also have a 7th grader and we moved here from Kentucky this summer. We have a family history of type 2 diabetes and have watched loved ones struggle with the physical and emotional toll of it. Since my children were born, I have been doing all I can to improve their odds of avoiding a future of diet-related disease. That includes working with schools on strong wellness policies that address not using food as a reward, healthier celebrations and fundraising. Last week I contacted the Seattle Public Schools Wellness Task Force and learned a new procedure was aproved this summer. I brought a copy of it with me and am glad that we’re now in the implementation phase. I’ve worked with other schools in making these kinds of changes and having PTA support is a critical piece. The first step is letting parents and teachers know about the new procedure. It also helps to inform them about the reasons for each part of it. Finally we can also provide resources to help support. This new procedure includes nutrition standards for competitive food which includes fundraisers during the school day. 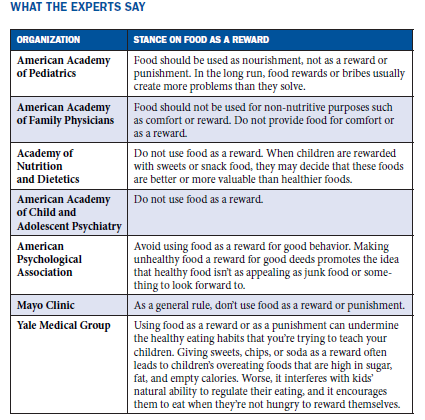 It recommends that rewards for academic performance or good behavior not include food or beverages. It also makes nutrition recommendations for food served at school celebrations and snacks. Transitioning a school away from using food as a reward is much smoother if the PTA also stops using food as a reward. PTAs also play a big role in the shift to healthier food at school celebrations. This can be as simple as sending out a sign up sheet for water and fruit instead of asking everyone to send in treats. From my short time here, I’ve been impressed by the thoughtfulness and caring of this school community’s commitment to supporting students. Helping to implement these changes is another way to show we care about their long-term best interest. I look forward to working with you on this and please let me know if you have any questions. Thank you. 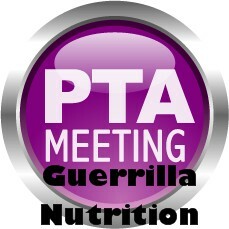 Please add any recommendations you have for guerilla nutrition in the comments section. Tags: advocacy, PTA. Bookmark the permalink. I love this post, Casey, and thanks for including one of my posts in the resource list. You’re welcome and thank you for inspiring me and so many others to speak up for kids’ health! Casey: Great post and a very helpful round-up of resources. Thanks so much for including my Year of Healthy School Parties! So glad that your meeting went well and you are off to a healthy new start in Seattle! Thanks Stacy and I was already contacted by a parent at the meeting asking for resources on planning healthier parties. It was great to be able to send her the link to your post! I love the title of this post! The school is so lucky to have you–I’m sure you will do great things there as you did in Kentucky. Thanks for including my handbook in your resources. Thanks Sally and your work on snacktivism was one of the first things that came to mind when I read the description of guerrilla nutrition.